9/17/18 The following was written by VHT Member and Volunteer, Chris Graziano for her employer, Travelers Insurance, and their Community Awareness program. Maryellen and I moved into the Victor community back in 1999 and quickly started to take advantage of our accessibility to parks and trails. With over 60 miles of trails our hiking and biking adventures were endless. 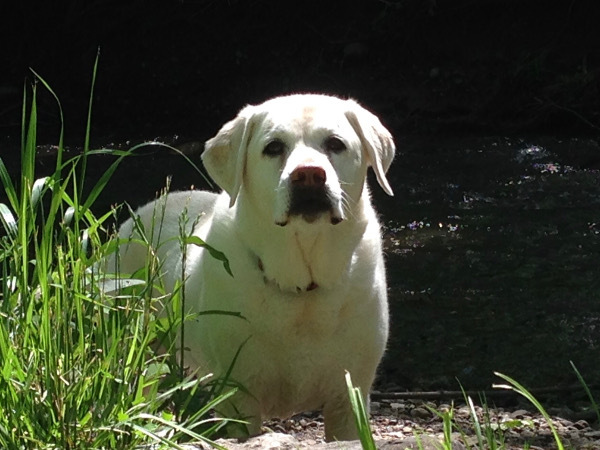 And, our dog Ellie explored each park with childlike excitement and couldn't wait for our daily outing. It never really occurred to me that it took time and energy to maintain the trails. They were always there ready for our use. Then, every once in a while we would see some people in bright yellow shirts mowing and trimming the lands. Seeing the words Trail Volunteer on the back of their shirts put things into perspective. 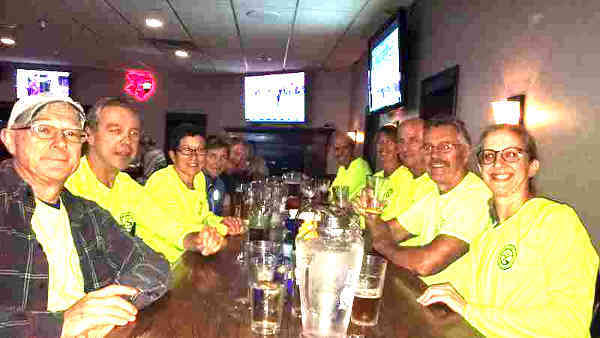 When they started advertising for volunteer with an opportunity to socialize at a local establishment follow the work session, we jumped in. Now, throughout the season, we spend one or two evenings a week helping maintain the trails. 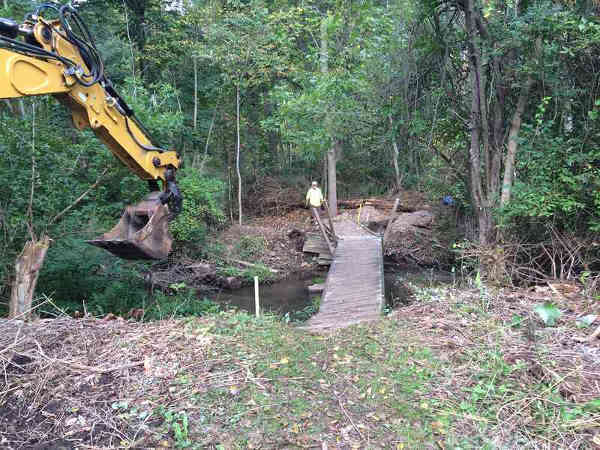 This includes mowing, trimming, painting trail signs, removing downed trees clearing new trails and building bridges. Building bridges is my personal favorite. 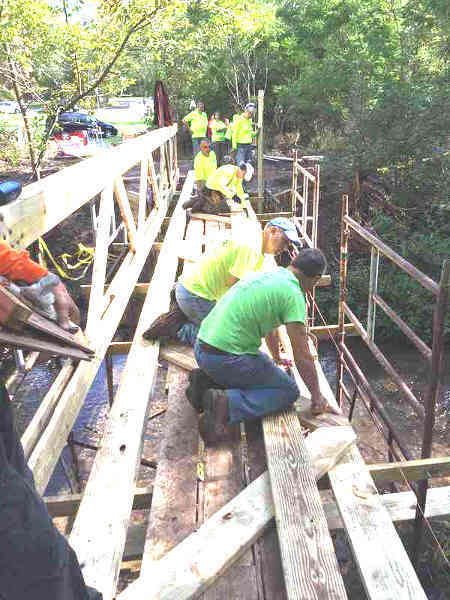 Our trail boss has a lot of construction experience and seeing the design and build come together to enhance our trail network is extremely satisfying. One of the largest bridge projects is highlighted in the photos and was completed in 2016. This was the Nat Fisher Memorial bridge honoring a special member of the VHT organization. Maryellen and I spent a number of hours over several months helping to complete the project. We take great pride in giving back to our local community so that everyone who is able can enjoy the trails. One of the added benefits has been the tremendous friends that we have made who share a passion for the outdoors and our local community. VHT is grateful for the support of Travelers. For every 24 hours of volunteer time that I put in, they receive a check for $500 up to a maximum of $1,000 per year. This is an organization that is funded by membership dues of only $10 per year so they generally have a small budget to work with. VHT maintains 35 miles of the 60 miles in our community with the town maintaining the additional 25 miles. The additional funds from Travelers go a long way to making sure that we have well maintained and up to date equipment so that the trails are ready and fully available to our community. Many thanks to Chris for the many hours and enthusiasm she and Maryellen have brought to VHT. And to Chris and Travelers for the considerable dollar contributions.